I recently ran into an issue where a buddy of mine was unable to find his original Starcraft disc and the CD case, but he had his Broodwar disc, which meant that he was without a CD key. Hoping to help him, I tried to use a few recovery tools, but they all failed to work, or were horribly outdated. I was later determined to figure it out non-the-less, and with a few minutes of your time, you can too. 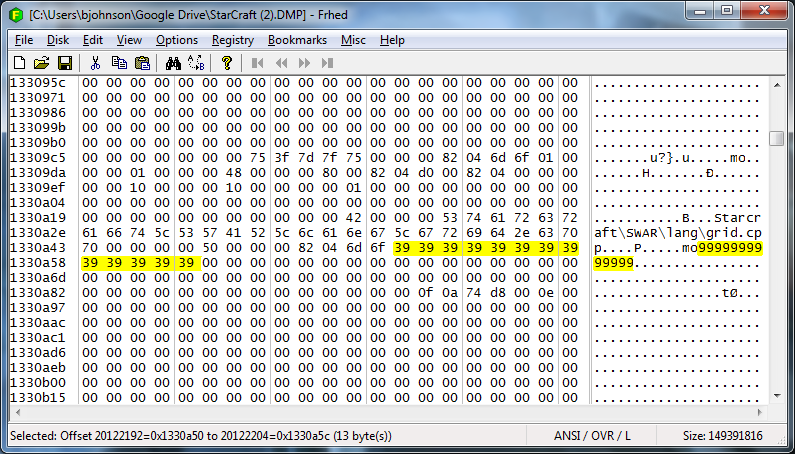 There is one tool we will need however, and that’s going to be a hex editor. In this example, I’m using the CD key of “9999-99999-9999”. Open Starcraft, and get to the Battle.net Login Screen but do _not_ log in. Hit Alt+Tab on your keyboard to get back to your Desktop. Hit Ctrl+Shift+Esc on your keyboard to open up the Windows Task Manager. Select the “Processes” tab, and find “StarCraft.exe” in the list. Right click on “StarCraft.exe” in the list and select “Create Dump File”. Copy the dump file to your desktop. It should be named “StarCraft.DMP”. Open up Frhed, and select File > Open to open the Starcraft dump file on your desktop. Select Edit > Find and Replace > Find… from the menu. For those that have a history with hex editors, in my quick tests, the CD key was not at the same offset, so I can’t really give a specific offset to try. This process is not as hard as one would expect. Once it’s completed, there is a big performance increase. (At least in my case there was.) I did this in XP, but I see no reason why it won’t work in Windows 2003, Vista, 7, etc. A requirement is to have the Viostor drivers on your virtual machine before you continue. They can be downloaded on the KVM Driver Download page. To start off, we need to create an empty disk image file, or temporarily link an existing one to the XP virtual machine. That can be done by adding -drive file="./temp.qcow2",if=virtio,boot=off \ to the configuration. Launch the VM with that configuration option added, and once Windows XP loads, it will ask for the drivers for the SCSI controller, which is Viostor. Point it to the directory that you extracted the drivers to, and it should install. After Windows XP installs the drivers, shut down Windows XP. Remove that temporary line that you added in Step 1 and change your real drive to say “if=virtio” instead of “if=ide”. After making that change, startup Windows XP again, and when Windows loads, it will reinstall the Viostor driver for that hard drive. Reboot, and you are finished. This guide will explain how to create a SSH tunnel to use with Firefox. Creating an SSH tunnel will create an encrypted connection to an outside machine to visit websites that may be inaccessible from a specific location. (Work, School, etc.) If my web site gets blocked at some point, it will probably be because of this article. The idea of this is not exactly to circumvent filters, but it works perfectly for that too. With the above command, <SERVER> is the remote server running the SSH service you will be using to create the tunnel. <PORTNUMBER> is any number between 1025 and 65535, and <USERNAME> is the username you will be using to connect to the remote server. After issuing that command, if you don’t get any errors, jump to Part 2. Launch PuTTY. On the initial screen, enter the remote address of the server you will be connecting to in the “Host Name (or IP address)” field. In the ‘Category’ list, expand the ‘SSH’ option, and select ‘Tunnels’. In the ‘Source port’ field, type in any number between 1025 and 65535. Select ‘Dynamic’ under the ‘Destination’ field, and click on the ‘Add’ button. Click ‘Open’ at the bottom of the window to start the connection. A new window will open up and prompt you for your user credentials. Enter your username and password. While entering your password, nothing will show up on the screen. After submitting your credentials, if you don’t get any errors, you should be successfully connected to the remote SSH server. First of all, if you don’t have Firefox, go to GetFirefox.com and download yourself a copy of it. If you are on a Windows machine that is not your own, consider grabbing yourself a copy of Portable Firefox for this guide and throwing it on a flash drive. After your copy of Firefox is up and running, whether it be Firefox or Portable Firefox, it’s time to install FoxyProxy. Add the add-on to Firefox, and restart Firefox when asked. Click the “Add New Proxy” button. A new window will appear. “Proxy Details” will be the tab initially selected. If not already selected, select “Manual Proxy Configuration”. In the “Host or IP Address” field, enter ‘127.0.0.1’ and in the ‘Port’ field, enter the port number you used in Part 1. Make sure the check box for “SOCKS proxy” is checked. We will be using “SOCKS v5,” so select that. Click the “OK” button in the “Proxy Settings” window. You will be prompted with a message about not adding any web addresses to the domain white-list. That’s fine, just click “OK” again. Once back on the main “FoxyProxy Options” window, just click the ‘Close’ button to close it. At this point, any web site you visit will be proxied through your SSH tunnel. If something is not working for you, go back and check all of your settings from Part 1 and 2. I figured this may be of some use to someone, as you can’t really find these in any obvious spot. To use any of these codes, all you need to do is add vga=code to the kernel parameters when booting. Using 1600×1200@32 bits as an example, the kernel parameter would be vga=799. If you want to be asked every time you boot the kernel, use vga=ask. Edit: For the record, I do realize that this table does not fit entirely within this layout. If you want to see the whole thing, just copy and paste it into a spreadsheet or something. Otherwise, I may make it into it’s own page or something eventually. Before we start, make sure your phone is in Data / Modem mode, and that it is not plugged in. Open a terminal, and make yourself a super-user. Now remove the usbserial module if it is loaded. Let’s register the phones vendor and product ID with the usbserial module. If you type in ‘dmesg’ now, you should see that your phone was assigned a tty pointer. If so, your phone is now a modem.